Sony has finally decided to update the Sony Xperia M C1904/C1905 models to its latest android 4.3 Jellybean 15.4.A.1.9 firmware. This update will be globally released in June 2014. The update will be released as OTA but PC companion can be used. 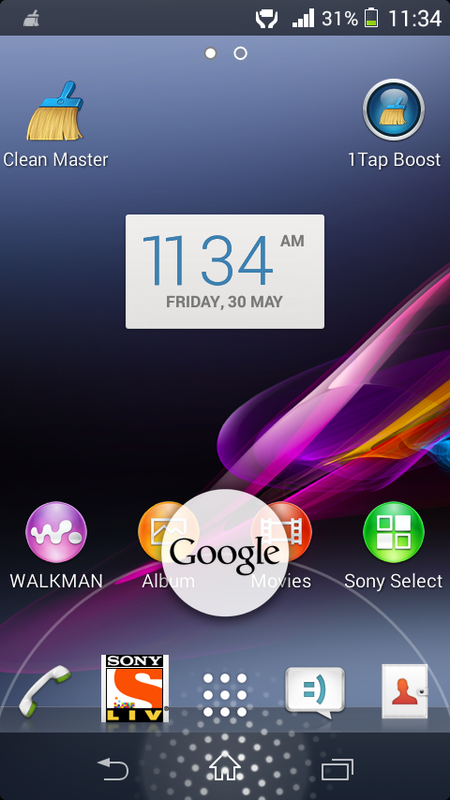 Currently the Xperia M is running on android 4.3 jellybean 15.4.A.0.23. The current android version 15.4.A.0.23 has a bug that is when you tap the home button the the Google Now launcher doesn't work, there is no response on long pressing the home. This is a bug and is going to be fixed in the 15.4.A.1.9 update. The latest Sony Xperia M update will include better user interface, faster performance and enough RAM availability. You can see in the image above that the Google holo launcher is working but after sometime it doesn't work. So if you have a Xperia M C1904/C1905 then do check the update center on your phone for latest system updates. Alternatively you can check the Sony PC companion to update the phone to latest android 4.3 update. Till the time sit back and relax, when the update is released we will notify you here. 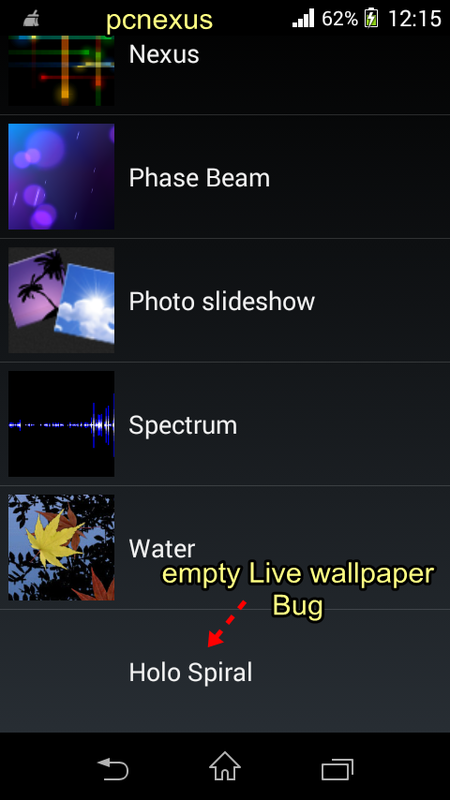 An empty live wallpaper bug is also there on Xperia M. When we open the list of live wallpapers we can see an empty live wallpaper named 'Holo Spiral' that can not be applied. There are two Holo Spiral LW on Xperia M out of which one is empty. This is the second bug. See the image below. So Sony is going to fix these two bugs in the new update 15.4.A.1.9. Updated since yesterday and the battery drain bug has been fixed and apps also optimized. Am from Thailand. What about the problems that I have written in the post. Are they fixed? My Model C1904, have not noticed the problems you encountered all other apps optimized and can be noticed when I use it. Other problems not noticed am using C1904. All I noticed is it's fast on all apps with no battery drain encountered as before. That's great. In some countries while using PC companion and Sony update service the update process gets stuck at 99% and shows 16 Hours 34 Minutes remaining. This means that their Xperia M are not still eligible to receive the 15.4.A.1.9 update. They should wait until they get an OTA notification in their phone. Sony has recommended through PC so that in case we encounter any problem(s) we can use 'repair' OTA if, I am not mistaken cannot be undertaken. Correct me if I am wrong. Oh, by the way using PC Companion - it took me exactly 25 mins and 49 secs. I am on fibre-optic with a d/l speed of about 40 MB/sec. In some countries the problem is that PC companion or Sony Update Service (SUS) gets stuck at 99% percent. I have wasted 2.5 GB data behind this and most of all my time. No your Xperia M is not updated. Check the OTA notification. Follow the steps below. 1. Open dialpad and dial this number *#*#7378423#*#*. 3. Then tap Software info. 4. Check "File System Version:". If it shows "WORLD-a_15.4.A.0.23" then your Xperia M is not updated to 15.4.A.1.9. I just suggest you to wait for few weeks instead of wasting your time and internet data. it is available now. Check the update center app. If you didn't receive the OTA, then use pc companion or sony update service.